Avro Atom - A Patchwork World model. The Atom is Avro's entry in the highly lucrative light fighter market. Evolved from the earlier 727 studies, the Atom has a smaller wing and more power, courtesy of an F.W.Royce "Poise" jet engine. The model will depict an Atom in the "Chezzle" scheme used by the Earl of Chester's Country Militia (Air Wing), and with the optional targeting radar for control of Artemis AAMs. 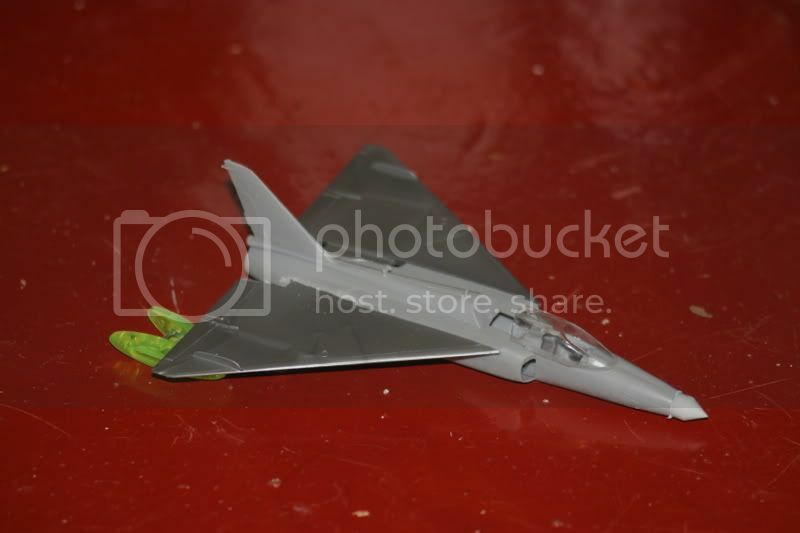 Model is an Airfix Gnat with Airfix MiG-21 wings and canopy. 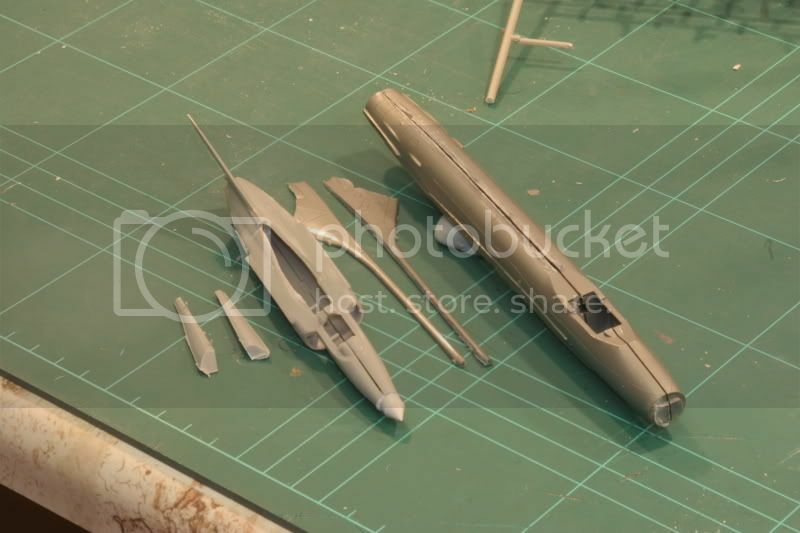 The nose cone is the exhaust cone from a Smer Me-262, and it will have a MiG-23 gunpod underneath. I hope to make 727-style forward-retracting u/c using a mix of MiG and Gnat component. This is the model I first wanted to do after finding this place, but my agenda's been dominated by the GBs. It still will be to an extent, so don't expect fast progress on this one. Correct me if I'm wrong, but that looks 1/144 scale. Interesting concept for a build, definitely. Looks almost like you could have named it Bolt, to go beside Arrow. Definitely looks cool. What have you got planned for the gap behind the canopy? Expanded view, extended enclosure? Looks very interesting. Hi Sauragnmon, welcome to the board, by the way. I'm going to make the canopy gap solid, since the MiG canopy isn't that different a shape to the Gnat's, and doing this will make it look more different. Don't know if you know, but the real Avro 727 was kinda like this, but with an even bigger wing . It was a competitor in the NBMR.1 Light Fighter competition inspired by the Gnat and won by the Fiat G.91. Looking foward to seeing this once it is finished. Hmm... still looks pretty cool though. Atom does work, and it rolls off the tongue too. I'm going to make the canopy gap solid, since the MiG canopy isn't that different a shape to the Gnat's, and doing this will make it look more different. Why not try grafting the Mig windscreen onto the Gnat canopy, and leave the whloe thing clear? Would afford the pilot better rear vision (see the Gnat whif thread elsewhere)? Well strictly speaking, you can't do that because it's an early MiG-21 forward-hinged canopy with the quarterlights made in one piece with the hood. However, the canopy framing is so faint/non-existent that I dare say I could wing it. The other option would be to cut off the Gnat's spine and graft the MiG's on: that would actually make it more 727-like and less "Gnatty", which is what I'm trying to achieve. Seen this? http://en.wikipedia.org/wiki/HAL_Tejas. Your 'Atom' could be its Grandad! btw, will you consider canard config? That is a cool looking little aircraft. Ysi - hard to say where you'd put canards really, isn't it? I won't be doing them on this one because one of the features of Patchwork World is the slower rate of technological progress due to it's fragmented nature. The tiny little countries that dominate it can't really afford any more R&D than neccessary, so once a design is in production, it tends to get produced for decades after decade. Thus a 1950s vintage Avro 727 would be developed (cheeply) to death, rather than replaced by something more modern. Ysi - hard to say where you'd put canards really, isn't it? I won't be doing them on this one because one of the features of Patchwork World is the slower rate of technological progress due to it's fragmented nature. The tiny little countries that dominate it can't really afford any more R&D than neccessary, so once a design is in production, it tends to get produced for decades after decade. Thus a 1950s vintage Avro 727 would be developed (cheaply) to death, rather than replaced by something more modern. Looks good so far! What about some LERXs like the Hornet has, coming forward over the intakes? You could put canards on those then, like the Flanker has. The Spineless MiG-21 is thought-provoking, isn't it?